Salon and website are our mainly customers,we have serviced for more than 500 salons and website.Welcome to join us. How make your salon/website looks more professional and more attractive ? 1, Must have your own pictures. 2, Must have the label with your own logo. *Label could show which hair type it is, cost is $50 for 1000pcs, will take around 3-5 days to finish. * Material by Non-woven, Weidth around "9.5inch" ,Height around "10.5in" , cost is $360 for 1000pcs, will take around 15days. * Material by silk , Weidth around "9.5inch", Height around "11inch", cost is $720 for 1000pcs,uaually takes 20 days. 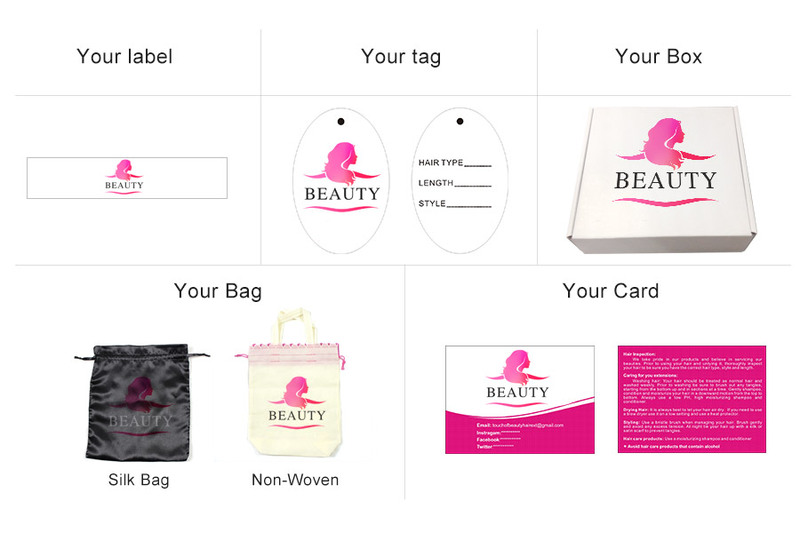 The above customized items in any one was used up, we would offer this free service for life. 3, top-class hair and express service.